It is indispensable equipment for batch production of clothes, shoes and hats, It can be used to cut various materials such as cotton, wool. And hemp, materials and silk etc. Having low noise, automatic sharpening, flexible and steady operation, this machine is the most ideal cutting tool for garment industry. Automatic and convenient in grinding, quick in cutting and bib in power. 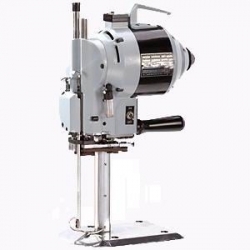 It is suitable for cutting fabric of cotton, wool, linen and leather etc. In batches. Having the features of large power, quick cutting and automatic grinding with emery belt.